Am miss Amanda, i view your profile hear and became interested to know you, please dear i want you to contact me with this email id, (omaramanda1@hotmail.com) to enable me send my Details and pictures to you for us to know each other better i hope to hear from you. Subject: MY DEAR FRIEND THIS IS ALL ABOUT ME. It is my pleasure to get back to you this moment, how are you, your business and your entire family? i believe that everything is going fine with you. I know this mail will not come to you as a surprise since we have not had a previous correspondence, please bear with me. I am more than happy to read your mail from my mailbox, and i hope that you are fine and healthy, i have noticed that you are the kind of person i am looking for since all this while, i believe that you are a trust worthy and caring person, that's what makes me to disclose my identity to you. My name is Miss Amanda Omar, 25 years old from Darfur Region of Sudan presently residing at the Catholic charity home here in Senegal, as a result of the the death of my parents by the rebels last year. Please don't be discouraged for hearing this, i believe deep down inside me that you will never break my heart or let me down in anyway. I am from the family of late Engr. Omar Salva, My late father Engr. 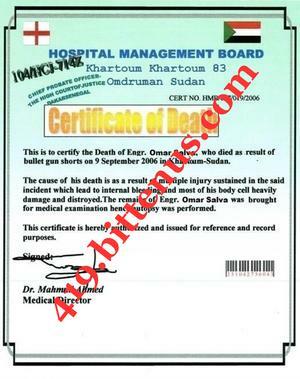 Omar Salva, was the vice chairman of Sudatel telecommunication in Darfur. The brutal killing of my mother and my father, one kid sister and my elder brother took place one early morning by the rebels as a result of the civil war that is going on until now in Sudan.I was in my second year in Applied Mathematics department of University of Darfur in Sudan before the crisis. My dear i contacted you for a possible help. My step mother was a very wicked woman and she intend to kill me since my father and my real biological mother are dead. Then, she planned to take away all my late father's property and some other valuable things from me since the unexpected death of my beloved Parents. Meanwhile, i wanted to find my way out of my country because, i have seen what she is planning to do to me, i thereby plan to go to another, but she hide my international passport and other valuable traveling documents, luckily she did not found where i kept my late fathers File which contains important documents, and i managed to escape with the documents which covers my late father's deposited money total $6.5 M USD (Six million five hundred thousand US dollars) which he use my name as the next of kin. Meanwhile, i am still residing here as a refugee under the Catholic charity organisation, i am saddled with the problem of securing a trust worthy foreign personality to help me transfer the money from the bank pending my arrival in your country, so that i and you will manage the money wisely. Furthermore, on your wish you can contact the bank for confirmation and you can communicate directly with them regarding this fund of my late father which was deposited in their custody. I am giving you this offer as mentioned with every confidence on your acceptance to assist me retrieve the money from the bank and transfer to your nominated bank account. I will like to further my studies as soon as i arrive to your country, please try to help me to achieve this goal as i have a desire to become a famous personality in the nearest future. I will be pleased if you can do this for me, you can reach me through this number (00221777864216), it is a Reverend Fathers phone number, by name Reverend Father Mark Paulson and email (fathermarkpaulson@yahoo.com) if you call, please ask of Amanda Omar, When ever you call, try to tell him that you want to speak with Amanda Omar, who is staying in the female hostel. Immediately i receive this, i will give you the contact of the bank where the money was deposited for you to contact them. Bye and take a good care of yourself and have a nice day. Subject: DEAR WRITE TO THE BANK FOR THE TRANSFER. It is a pleasure to get back to you this moment, how are you, your health and your entire family, i hope and pray that the goodness and mercies of God is protecting you all. As for me, am going through pains, grieves and horrible situation and i pray that everything goes well so that i can get out from this painful situation. Name of Depositor: Engr. Omar Salva. Name of Next of Kin: MISS. Amanda Omar.. Date Deposited: 7th January, 2004. I will give you 25% of the total sum for your assistance and 5% for expenses, while the rest will be manage by you, in any business of your choice. While writing to the Bank, tell them that you are the foreign partner to Miss Amanda Omar, whose late father deposited money in their bank with her name as the of kin, and that you want to know the possibilities of transferring the money into your bank account. God bless you as I wait to hearing from you once you receive any reply from the bank. Take care and have a nice day. I have been directed by the Director, Credit Administration Dept to write you in respect to the mail which we received. Actually, we have earlier been told about you by the young lady Miss Amanda Omar, that she wishes you to be her Trustee/Representative for the claim of her late father's deposit with our bank. To enhance quicker processing of this fund, you are to provide this bank with the following information requested by our bank. We promise to give our customers the best of our services. Should you have any question(s) please contact us (clydesdalelondonbank@aol.co.uk): through Tell: +447045761517: our foreign transfer officer Dr. Gerry Higgins. For: Clydesdale Bank Pl C.
Subject: DEAR CONTACT THIS LAWYER FOR THE OTHER DOCUMENTS FROM THE HIGH COURT OF SENEGAL. How are you? I believe you are in good health, as for me, I thank God for seeing today, it is my prayer that God will open all your ways and bless you in everything you are doing to live there in your country Amen. I am thanking you for your love and brotherly care towards me and i promise you love until the rest of my life. My dear, about the required documents the bank needs from us, am here with the statement of account and the death certificate, which i will give to the lawyer when he agrees to help us, so that he can send them to you with the attorney and the other document from the high court of Senegal and i also attach those documents for your verification. Those documents are the only thing the bank needs from us before they will transfer money to your account. So I went and told the Rev father who is taking care of the refugee about it, and he gave a call to a respected lawyer here in Senegal, and he is a lawyer registered at the Park of Nations and also registered as a member of (Senegalese Bar Association), i believe he will help us to obtain the documents from the high court. My dear, contact him for the preparation of attorney and affidavit of oath, and make sure you come back to me once you receive reply from him and let me know if he agrees to help us. Please, I would like you to first get the money transferred and from it you will send some money for me, to prepare for my travel documents to meet you and also enjoy the rest of my life with you there, my love I want you to know I'm praying and fasting for you. I strongly believe that God will answer our prayers, thank you once again, and God bless you, i am waiting to hear from you soonest, have a wonderful day. With much love from my deepest heart. Subject: FROM BARRISTER THOMPSON CHAMBERS. It has been confirmed from the Senegalese high court that we will be able to get the number of legal documents from the High Court of Justice here in Dakar Senegal, after the court verified the documents presented before them.To obtain the documents required by your partner's bank,the following bills are giving by the court for the issuance of the documents. (1)Swearing the Oath of Affidavit = 650 Euros. (2)Stamping on Power of Attorney = 380 Euros. (3)Authorisation letter = 300 Euros. my legal service charges = 400 Euros. It is advisable to send all the information you used to pay the sum and also call me on the phone when you wire the sum so that i can tell my secretary to pick it up and then i will go and pay the high court of justice. You can call me on Tel: +221772909842. Subject: THANK FOR ALL YOUR EFFORT. I am very much grateful to receive your message this morning, how are you, your family and your health which is the most important thing to me, i hope everything is going well with you? I want to thank you for your passionate towards my sufferings over here, i pray that God almighty will see us through very soon so i can come over to your country once the transfer is done to spend the rest of my life. My coming to you for this transfer is not by my power rather by the confident i have in you after my fasting and prayers that you will guide me to success and from messages and questions to me, you have proved that you are God sent to my situation and i want to assure you that i am a blessing to your life. Like i told you earlier, i came here through the help of Catholic charity organization that are overseeing the victims of war then in my country. When got here, We were registered as refugees and also staying at the Catholic hostel under the control of United Nation for refugees and our supervisor is Rev father Mark Paulson. Please sir, i have the confident and trust in you and i want you to look at me as part of your family and i will respect and love your family all my life. I have been going through difficult and painful condition since i came here but i know that God knows why am going through all these. I am subjected to a square meal for a whole day but i feel stronger everything through God who strengthen me. I have seen the reply you got from the lawyer concerning those documents the bank needed before they can proceed with the transfer. Please sir, go ahead and send the money to him since the court here have accepted to give us those documents. Like i asked in my previous message,i want you to look for a good business you will invest the money once after the transfer because i will like to proceed with my education once i join you in your country. 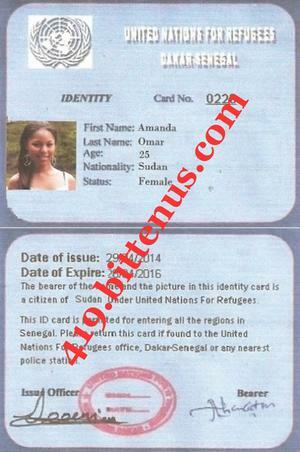 Thank you once more and i attach my refugee identity to you which you requested. May God be with you Amen. I am very happy to inform you about my success in getting the fund transferred under the co-operation of a new partner from Ireland. Presently, i am in Ireland for investment projects with my own share of the total sum.Mean while, I didn't forget your past efforts and attempts to assist me in transferring the funds despite that it failed us some how. Now you will need to contact the Rev father controlling the camp because,the former one has been transferred to Kenya, and the present father's names is Rev Stephen John and his email address is:(revstephenjohn38@yahoo.com) Ask him to send you a certified bank draft of (180.000.00) Euros which I prepared and kept for your compensation for all the past efforts and attempts to assist me in this matter. I appreciate your efforts at that time very much. So feel free and get in touch with the Rev Father and instruct him where to send you the draft cheque as soon as possible because it's yours and i kept it for you. Please do let me know immediately you receive it so that we can share our joy and happiness after all the sufferings at that time. In the moment, I am very busy here because of the investment projects which me and my new partner are having at hand.